The first group of Olympic horses departed from London Stansted Airport (UK) a few days ago (29 July) on a special cargo plane bound for Rio 2016, marking the start of the Olympic dream for the world's best equine athletes. 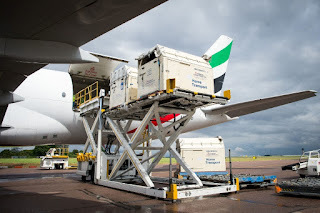 With 34 horses from 10 nations on board, the equine cargo worth multiple millions, was loaded into customized pallets for the almost 12-hour flight aboard an Emirates SkyCargo Boeing 777-F which left the UK at 15:20 BST . The first group of Olympic horses departed from London Stansted Airport (UK) a few days ago (29 July) on a special cargo plane bound for Rio 2016, marking the start of the Olympic dream for the world's best equine athletes. With 34 horses from 10 nations on board, the equine cargo worth multiple millions, was loaded into customized pallets for the almost 12-hour flight aboard an Emirates SkyCargo Boeing 777-F which left the UK at 15:20 BST . Eventing horses from Great Britain, Ireland, Canada, Australia, New Zealand, Zimbabwe, Brazil, Japan, Italy and China were on board Friday's flight out of Stansted, the first of nine shipments delivering more than 200 horses to Rio International Airport, en route to the Olympic Equestrian Centre in Deodoro Olympic Park. This highly complex operation involved three hubs in Europe and America: Stansted (UK), Liege (BEL) and Miami (USA). The competing horses and their riders will represent 43 nations from around the globe in the Olympic disciplines of Dressage, Jumping and Eventing. From airport arrival to check-in, loading onto the plane and taking off for Rio, the FEI is providing a stunning set of images and video footage documenting this exciting day, giving us an incredible insight into how these precious athletes embark on their journey towards Olympic glory.